Live your Island dream-life at Fish Creek in Ozello Keys where nightly sunsets are reflected in the bay and included in the price of admission. 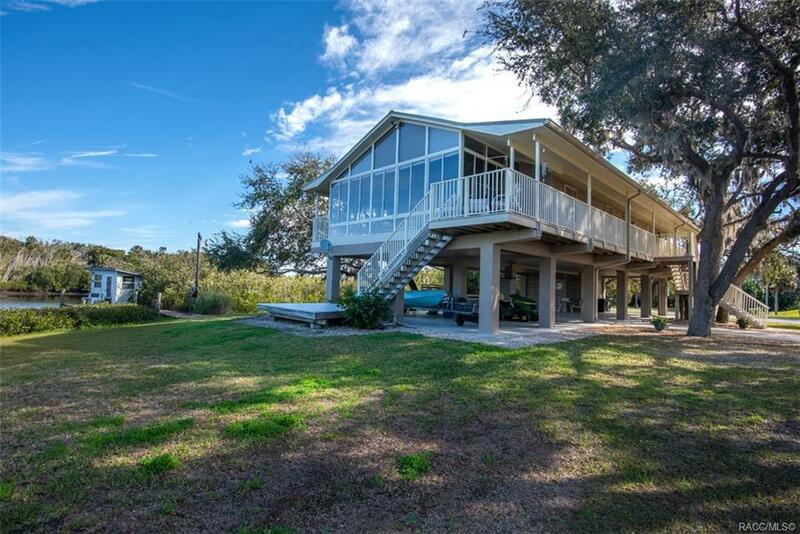 1.4 acres of groomed waterfront property that harbors its own safe lagoon with floating boat lift, 10x12 covered deck and a concrete boat ramp. 50Amp RV parking next to 28x36 detached garage with workshop and storage. This custom designed stilt home is 16'4" into the trees and 4â4â above BFE and features plenty of parking for toys underneath and a (2016) metal roof overhead with gutters and guards for years of carefree protection. The entry stairs, 4â wrap-around walkway and sun-deck are all made of splinter-free composite board. Inside you'll be drawn to the beautiful kitchen w/solid countertops, integrated sink, wood cabinets and large deep pantry w/pull out shelves. But the real living takes place in the West room with heavenly views day and night through floor to ceiling windows! And, yes honey, you can have the dream closet. Directions: 7 Mile Marker On The Trail And You're There! Turn Left Onto Trachel Dr And Right Onto Driveway.